Colliers International announced today it has agreed to consolidate its business in the Czech Republic with the THREESIXTY Agency, bringing to Colliers their extensive pipeline of deals, relationships and successful track record. 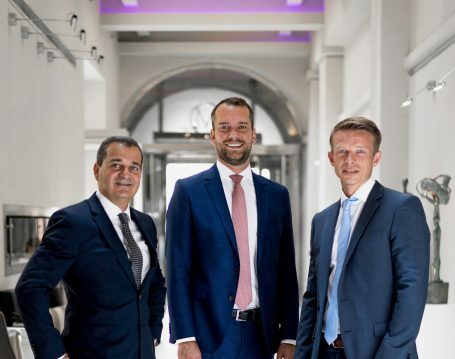 The THREESIXTY partners Tewfik Sabongui and Petr Žalský will become equity partners of Colliers International, Czech Republic, with Tewfik Sabongui taking on the role of Managing Partner and Petr Žalský in the role of Director of Office Agency. All other THREESIXTY employees have also joined Colliers, effective immediately. THREESIXTY, established in 2017, offers a wide range of transactional, consultancy and advisory services in the Czech Republic and Central & Eastern Europe to local and international clients, developers and investors. It has quickly built a reputation as a trusted and passionate advisor across all sectors. Prior to founding THREESIXTY, Sabongui was Managing Director of JLL Czech Republic for 10 years and Managing Director of Tetris Design & Build Czech when it was established in Czech as part of JLL. Žalský was previously Head of Leasing for CA Immo in the Czech Republic and before that held various senior positions with JLL in the Czech Republic. Colliers is one of market leaders in real estate services across Czech Republic, with more than 30 professionals, providing a range of services including; industrial and office agency, investment, valuations, building consultancy, asset & property management and workplace solutions services to clients across Czech from offices in Prague.